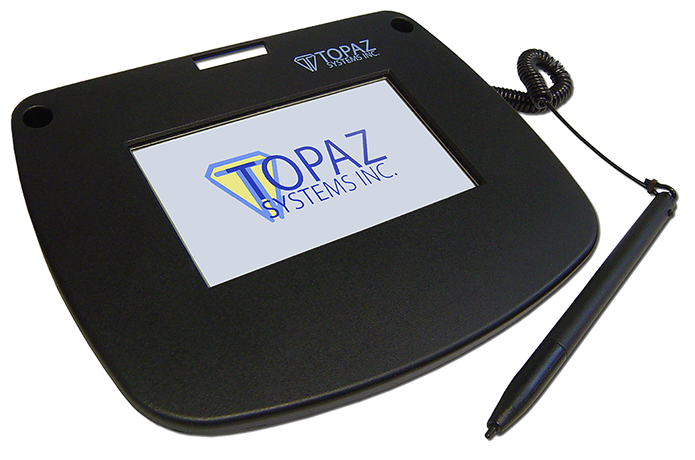 The SigLite®Color 4.3 is an advanced biometric electronic signature pad with full-color 480×272 widescreen backlit TFT Port-powered in both HID and virtual-serial USB versions, the SigLite Color4.3 sports a small, thin, and attractive footprint, optimized large handrest, dual vertical pen holders, snap-in travel pen-and-tether storage, and sloped ergonomic signing surface with easy slide-in screen protector.All Topaz products come bundled with our powerful software tools and support for the capture, binding, and authentication of electronic signatures. All software and updates are licensed for use with Topaz tablets at no extra charge and can be downloaded from Topaz website. Download the SigLite Color 4.3 Installation for use with the SigLite Color 4.3 signature pad.